One of the things mentioned most in our feedback column, is the lack of golfing opportunities for beginning to mid-level golfers in the metro area. Many of the courses designed in the 1990's were of the upscale variety - with high slope ratings. This is great for the better than average golfer - but intimidating for the beginner. Pine View Golf Course in Ypsilanti presents an opportunity for golfers of all skill levels to get their kicks - with slope ratings on the 4 tee boxes ranging from 115 to 132. 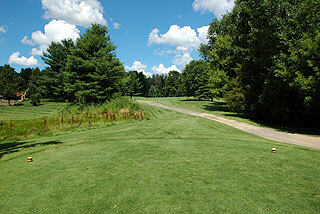 It is a pretty course with a variety in terrain. The front nine, called the Open Pines, is just that - a wide open design allowing much room for error off the tee. The few doglegs are quite gentle and the hazards are minimal - only 1 water hazard and just a few bunkers. The middle tees measure 3136 and the backs are playable at 3256. The back-side presents different challenges, in the form of tight tree -lined fairways with gradual elevation changes, and tricky doglegs, though the distance is quite similar. For beginners or those strapped for time, Pine View also has a nine-hole Executive course measuring 1,818 from the tips and 1,444 yards from the front tees. Narrow fairways and water hazards make this layout interesting. 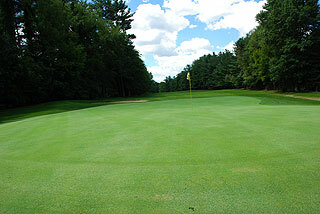 On all 27 holes, golfers will find mature pines and hardwoods along the fairways, reminiscent of Northern Michigan golf. 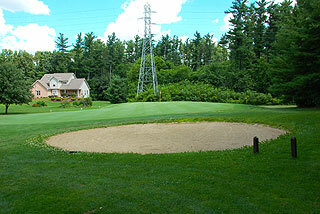 On property are 3 practice putting greens, including one equipped with a bunker for sand practice. A grass driving range with target areas is also provided. The clubhouse features a full pro shop, and a restaurant and lounge for everyday use, and for banquets and outings. The golf course is well-marked, with 100/150/200 yard stakes on all the par fours, and additional 250-yard stakes on the par fives. These are quite visible and make excellent targets, particularly on the doglegs. Small flags on the flag sticks indicate the days pin placement. Hole diagrams are provided for on the scorecards, and are also present on the tee areas. 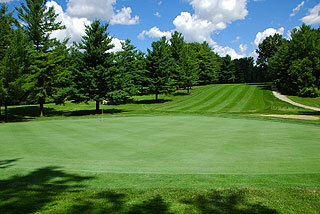 All greens are bent grass, while the tee boxes, fairways and rough feature Bluegrass. The efficient design allows for modestly quick rounds - with an average of 4 hours and 6 minutes. 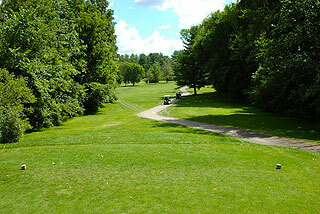 The opening hole is an easy par five that bends slightly right and plays downhill. A bunker on the left front of the green and trees near the tee area on the par three 2nd make this hole a challenge, where par is a good score. There is lots of room for error off the tee on the mid-range par 4 third and also on the par five 4th. An undulating green and fairly narrow approach keep it interesting here. Though number 5 looks tight from the tee, you will find lots of open space on all sides of the putting surface. Like the first three holes, the green here is fairly flat and very putt-able. Next up is the number one handicap - a sharp dogleg right par four, that can be cut off the tee by long hitters. Aim along the tree line right, and you will be left with a wedge or short iron approach. A safer play is to aim towards the center of the fairway, being careful not to run it through. The fairway on number seven is the narrowest on the front, and bends right to left. The middle of the fairway leaves the best approach here. The par four eighth is a pretty hole, featuring an elevated tee and a fairway that bends left to right. Only long hitters who can approach the 100 yard marker should attempt to cut the dogleg here. The approach is tight and one club uphill. Personally , I found this to be the toughest hole on the front, though it is rated just the # 8 handicap. Number nine bends slightly left, but water on that side will deter any thoughts of shortening this hole. Unless you can hit over 250 yards off the tee, the center of the fairway is the prudent play here. Number ten opens the back with a gentle right to left dogleg that plays downhill. Land on the fairway off the tee, and this should be an easy par five. An uphill tee shot awaits on eleven. 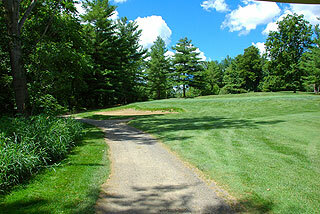 The approach is downhill along a narrow fairway that opens up near the green. Twelve is the easiest par three on the course, and is followed by a sequence of tight driving holes, featuring blind tee shots. The 13th plays uphill off the tee. Aim for the tower and approach carefully, as the green is perched with woods right, a bunker left, and depressions short and long. Number 14 is also tight, playing parallel to 13 but in the opposite direction. The approach here is a pretty one - playing downhill to a well protected putting surface. 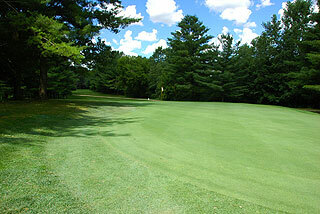 The short par four 15th also features a blind, uphill tee shot, and a green flanked closely by mature pines. The next hole will drive first time visitors to Pine View crazy! A well-placed tee shot may or may not leave a clear approach to the green. A huge tree is perched in the center of the fairway about 110 yards out. Hit just left of the fairway bunker, near the 150, and hope for the best. This precedes a tight par three to an elevated green protected by bunkers short left. 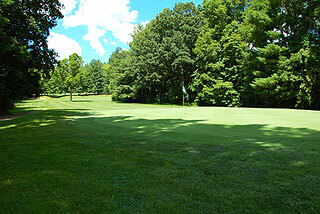 A dogleg right par five that cannot be cut, provides a formidable challenge on the finishing hole. Aim for the middle or left side of the fairway off the tee - and grip it an rip it on the second. The tight nature of this hole makes it a three-shot par five for most golfers. The putting surface plays uphill towards the clubhouse with bunkers on each side. The green is two-tiered so pay close attention to pin placement. The average golfer should be able to score their handicap at Pine View. The front provides a good opportunity to warm up, while the back-side demands accuracy off the tee. Land it on the fairway (the 150 is generally a good target) and the approaches are quite simple - with minimal undulations ( a few exceptions) and bunkering. At just $36 weekdays and $40 weekends, this is a pretty good value for a mid-scale golf course. Pine view is located just a few miles off the I-94 freeway. Exit west off of Huron (exit 183), go one mile and turn right at Stoney Creek Rd - it is 1/4 mile down on the right.